Why rent our log cabin? Crisp blue skies, clean mountain air, and the sounds of silence coupled with a cozy log cabin. Are you looking for a place for your family to relax and rejuvenate from the treadmill of life? Commune with nature, reestablish family bonds and rekindle relationships around the fire! We hope you enjoy our peaceful, secluded log cabin. Our cabin sits on a secluded 3-acre wooded mountain property less than 90 minutes from Denver and Colorado Springs. It’s only 20 miles to Breckenridge. The cabin is easy to find located just 3 miles off CO Hwy. 9 and 5 minutes from Fairplay and Alma. The cabin sleeps 14 (12 in beds, with additional sleeping on sofas, pullout sofa, crib, and foam floor pads). - Upstairs Master Bedroom – king size bed, single bed, crib and foam floor pads. So if 'vacation' means returning to the simple life, then our cozy, comfortable, down-to-earth cabin is for you. It’s a great place for a secluded get-away or a family/group to reconnect with one another. While living in Colorado Springs, JP and Michelle decided to pursue our dream of a cabin in the mountains. We knew the day would come when we'd move back to Lafayette, LA to be closer to family. We hoped that when the day for the move came, we'd be able to keep our mountain cabin. Now we enjoy family vacations to the mountains for ski trips and to escape the heat and humidity of summertime in Louisiana. Sharing our cabin with VRBO renters has been another blessing. We chose Park County so we could be in the mountains without all the craziness of a tourist town. We love visiting the museums and shops in Fairplay during the summer. And we ski at Breckenridge, Keystone, A-basin, Vail and Monarch in the winter. Fairplay is centrally located for excellent fishing in the summer. It's a 1.5 hour drive from either Denver or Colorado Springs. 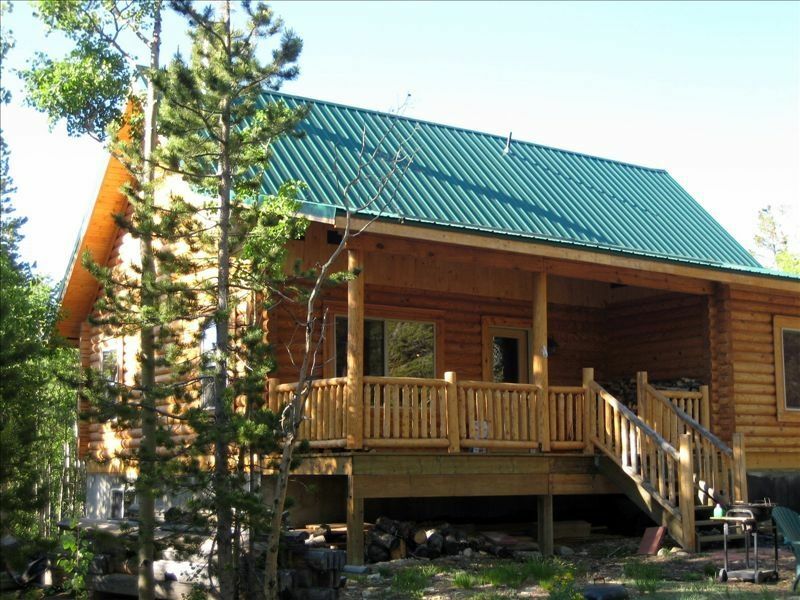 Our cabin is located on 3 acres in the Sun Mountain sub-division. We love the quiet! So quiet that you can hear your ears ringing! Our time at the cabin is a time to unplug from the rest of the world. No TVs or internet connections here. Just lots of family time around the wood stove, games, storytelling, reading and walks in the woods. I loved the place just had minor issue but it got resolved. Thank for you understanding the beds in the basement were very comfortable very clean and peaceful place. Kids and husband enjoyed the ping pong table. We had an awesome stay. Property is quiet and peaceful. It took my 2 teens a couple of days to get used to no internet and cell service. We soon replaced that with ping pong tournaments and some fun game that gives you a small shock. Found the perfect places close for fly fishing and white water rafting. Breck is close and a scenic drive there. Enjoyed our time in this wonderful cabin! Would recommend to anyone wanting to get away from it all! No TV, no wi-fi- just beautiful woods and scenery all around. Quiet and private, just the place for family to relax and connect. Very clean cabin. Easy drive into Breckenridge. Great access to many nearby hikes. We enjoyed our staff in FairPlay. The location was really good. With a ranger station in town, we quickly got trail info and started hiking. The cabin is on a ridge up a decent enough road for a minivan. Two families slept comfortably without issue. Loved the kitchen and the washer and dryer. And we LOVED the absence of the TV. Great time in the evenings eating together, conversing and playing games. A great cabin in the woods.